Join us for our BIGGEST book sale of the year at 109 E. Jefferson St. Macomb with a weekend of activities in conjunction with Macomb Heritage Days. Be sure you check out the media, oversized books, cook books, graphic novels, vintage books, and more inside the Library Annex. Thurs. June 27– 4 to 6:00 p.m. Members Only Preview Sale. Join Friends of the Library starting at $10 and get a dozen books at half price. Friday June 28 — 9 a.m. to 4 p.m. Public sale under tents and the Annex. Saturday June 29 — 9 a.m. to 4 p.m. with a bag sale from 3 to 4 p.m.
As you walk into the main entrance of the library, look to your right and you will see a large shelving unit with hardbound books and a wooden flat bed case full of paperbacks. This has doubled our in-house books available to you for a suggested donation fee with a donation box in the center of the tall book case. Check it out! 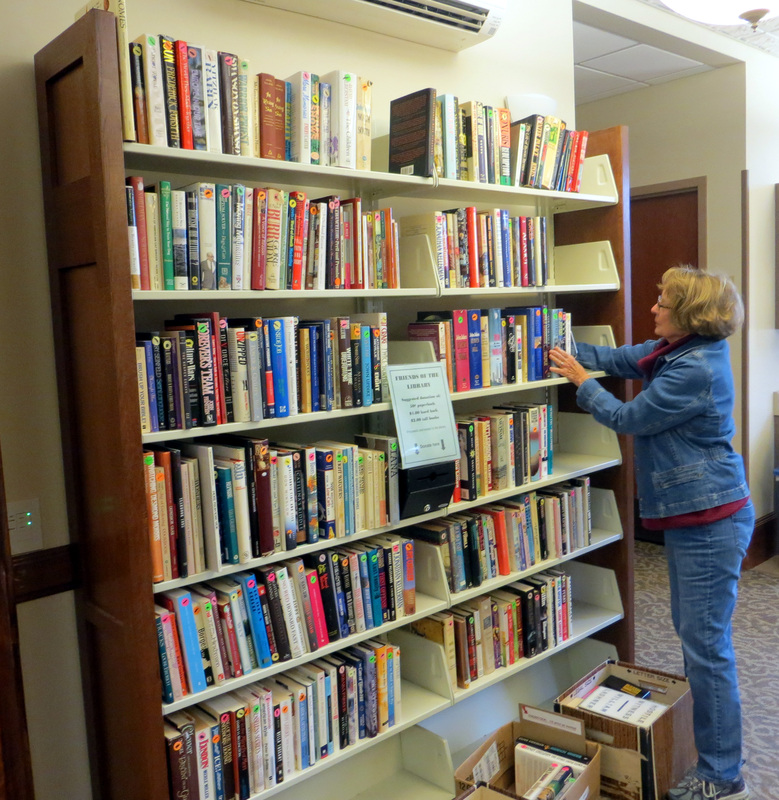 Kate Joswick, Friends board member, is pictured above re-stocking the shelf. Comments Off on Expanded In-House Books for You! The Spring 2019 Bookmark Newsletter is edited by Karen Proulx. This issue contains all the information about our April 11 Annual Meeting and Dinner including the reservation form and membership renewal form, news about our new Facebook page and social media consultant, Face to Face with board member Dave Vawter, a look at upcoming activities in the library, and more. Click on Spring 2019. Comments Off on Check out the latest newsletter!